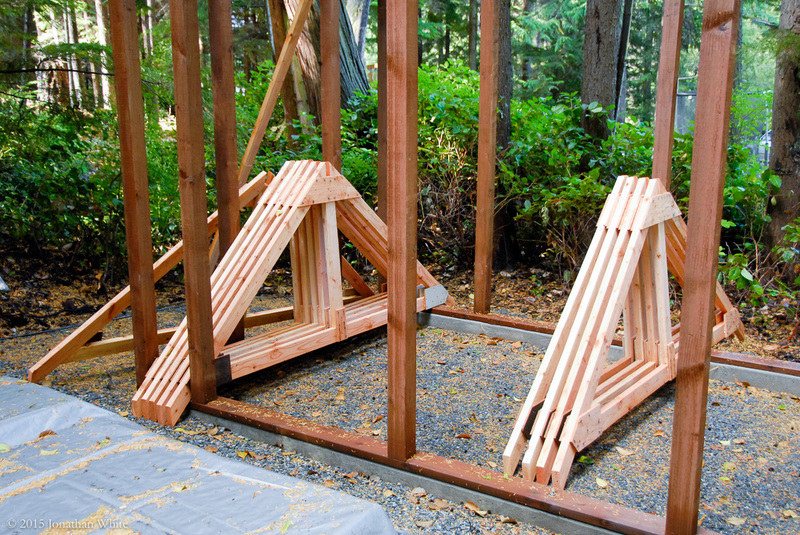 I finished up my last blog post with all the walls framed and erected. 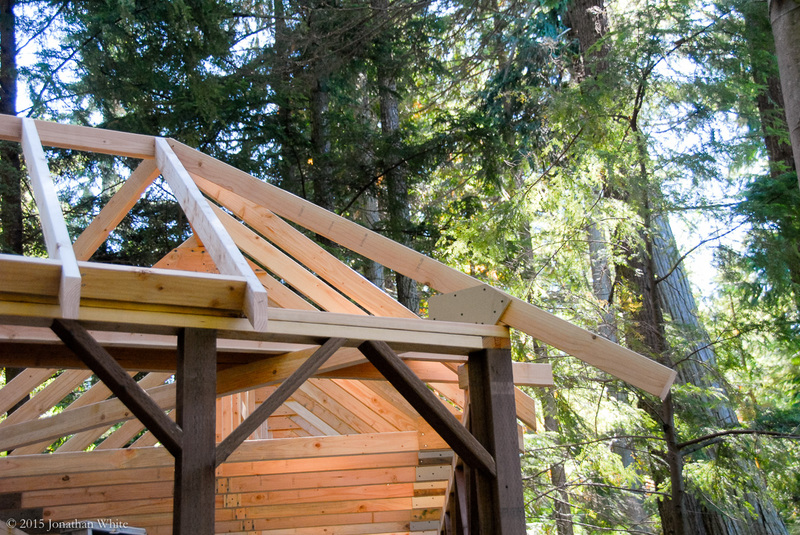 The next step was designing and then building a bunch of roof trusses. I looked online and found a great tool here http://design.medeek.com/calculator/calculator.pl. This really helped me get a good idea of what I wanted to build, but I had to figure out the dimensions of all the individual parts myself. The coop is under a lot of fir and cedar trees, so pine needles building up on the roof will be a problem if the roof has a shallow pitch. For that reason, I settled on a 10:12 pitch roof. This equates to 40°. 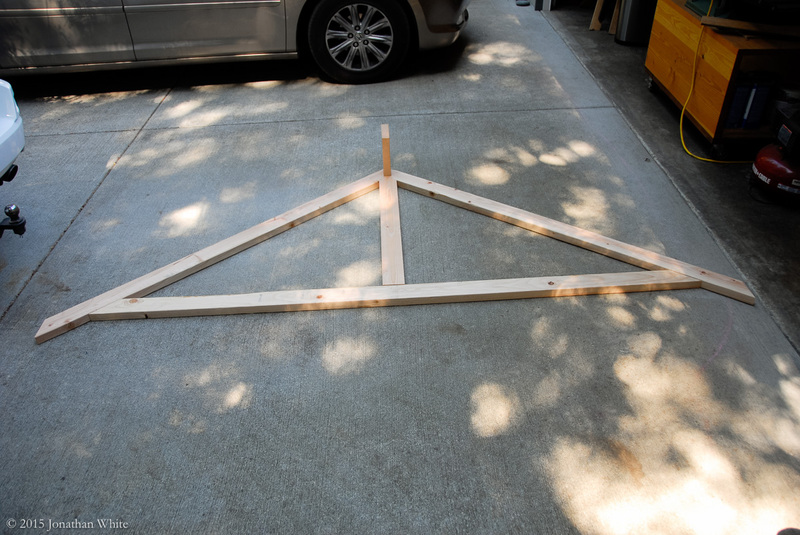 The basic layout of my 10/12 truss. I modified the design that I found online slightly. 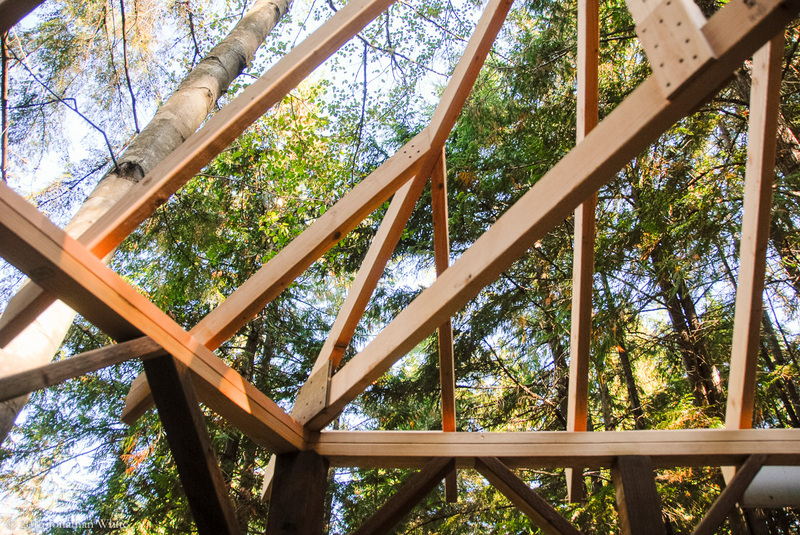 I wanted to have a ridge board along the peak of the roof, so built the trusses in such a way that one can drop in later. 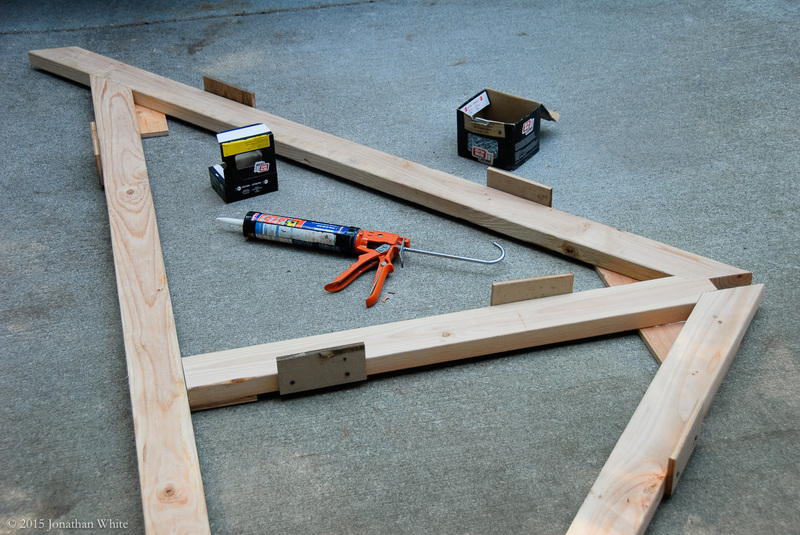 Laying out the pieces for my prototype roof truss. Construction adhesive, screws, and nails. 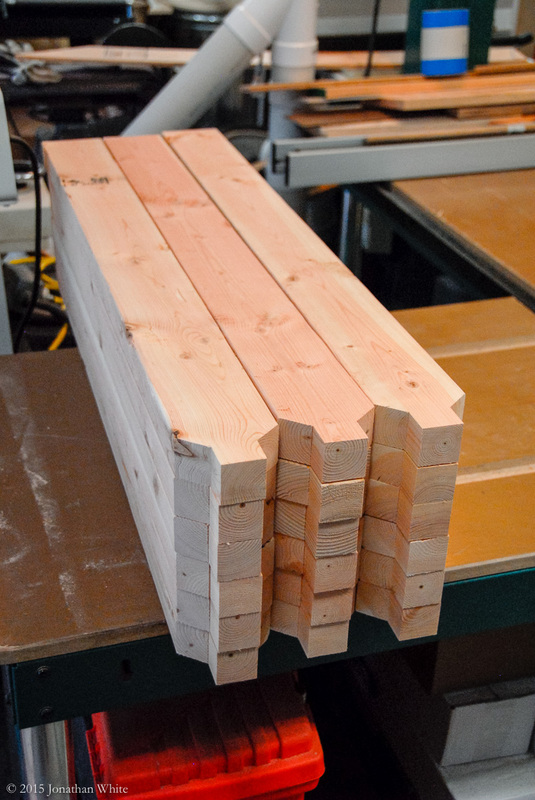 I estimated that each truss cost me about $10 to make. 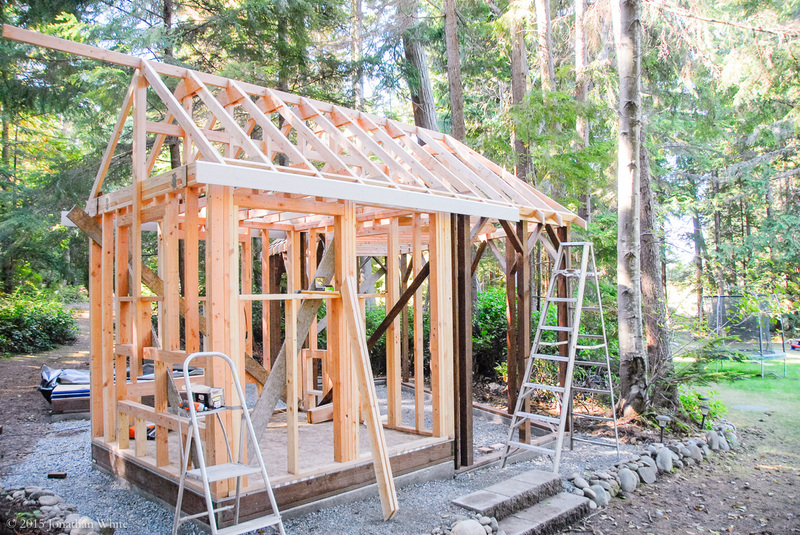 I’m guessing that this is way cheaper than ordering trusses. 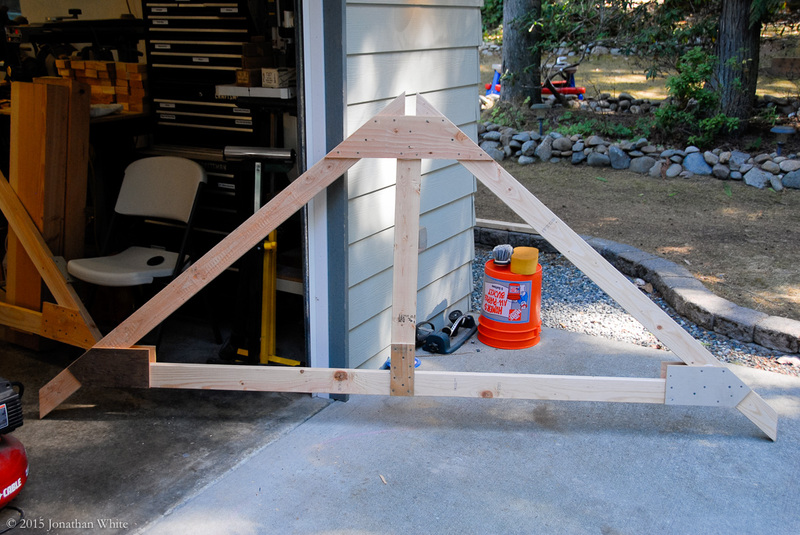 I made a prototype truss to test and confirm the dimensions, and then spent a few days batching out all the parts. Keep in mind I was doing a few hours each day before going to work, but it took the better part of a week to design and cut out all the parts. 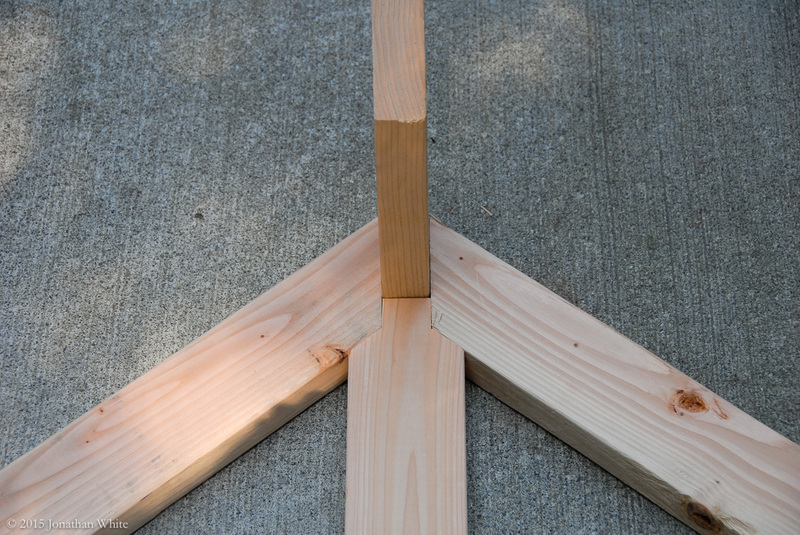 A closer view of how the top of the truss comes together. 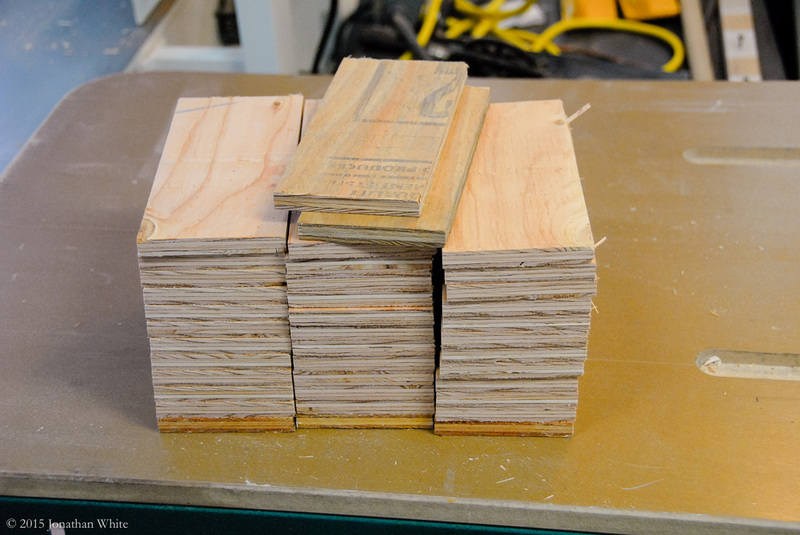 I put a scrap off-cut in to simulate the ridge board. The ridge board will sit directly on top of the king stud. 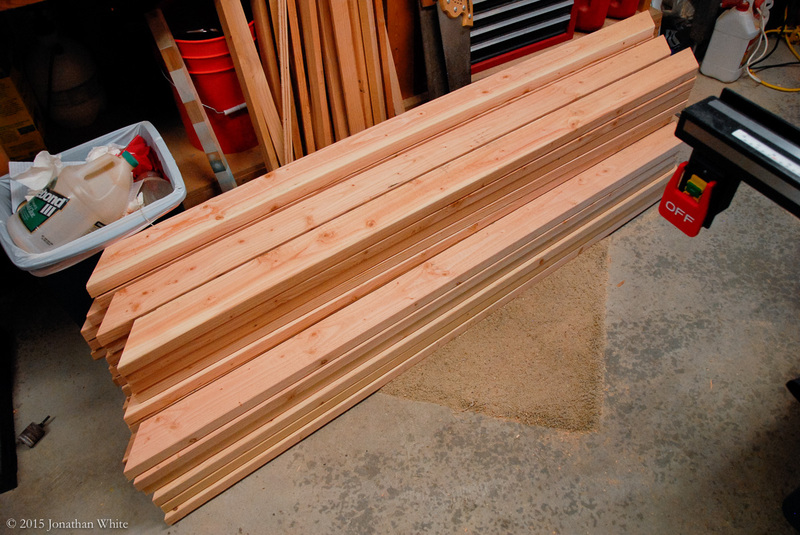 A whole bunch of rafters ready to be made into trusses. All of the 8-foot bottom chords. 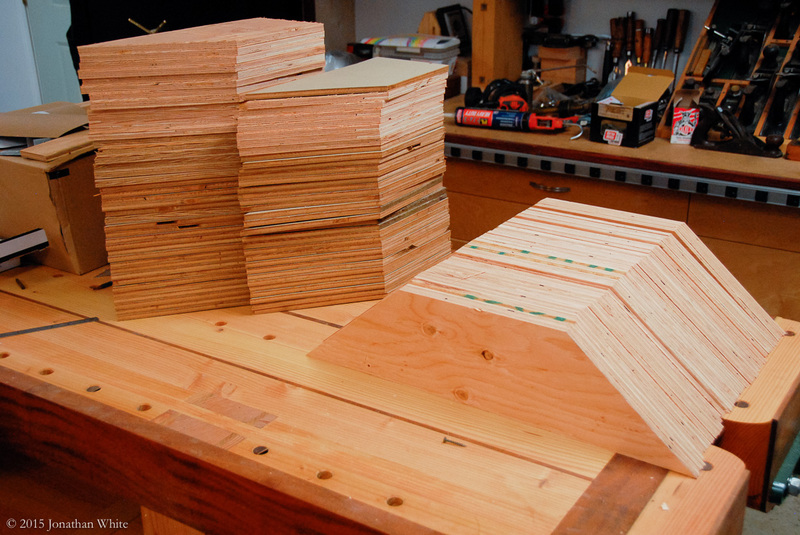 Plywood gusset plates for joining the truss parts together. I realized that I forgot to make plywood gusset plates for the bottom of the king stud, so went back to make these. OK… ready to get started at last. 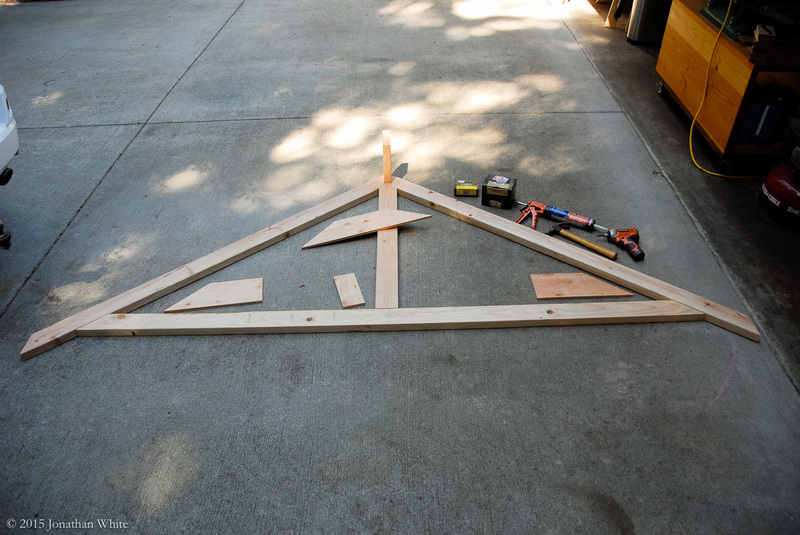 I gathered all the parts to make the first truss. I used PL375 construction adhesive and screwed then nailed the plywood gusset plates on. Everything ready to start the assembly. 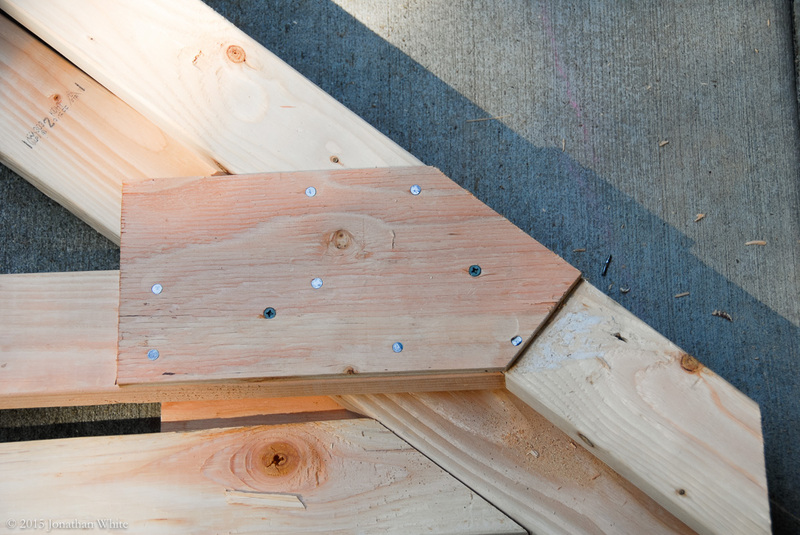 The plywood plates were glued, screwed, and nailed to the truss members. My neighbor came over and pointed out that the outer plates would obstruct the 2×4 blocking that I will need to install later. I got out my combo square and then trimmed the plates back with a sash saw. I realized after the fact, that the plywood plates would get in the way of the blocking when the trusses are installed. 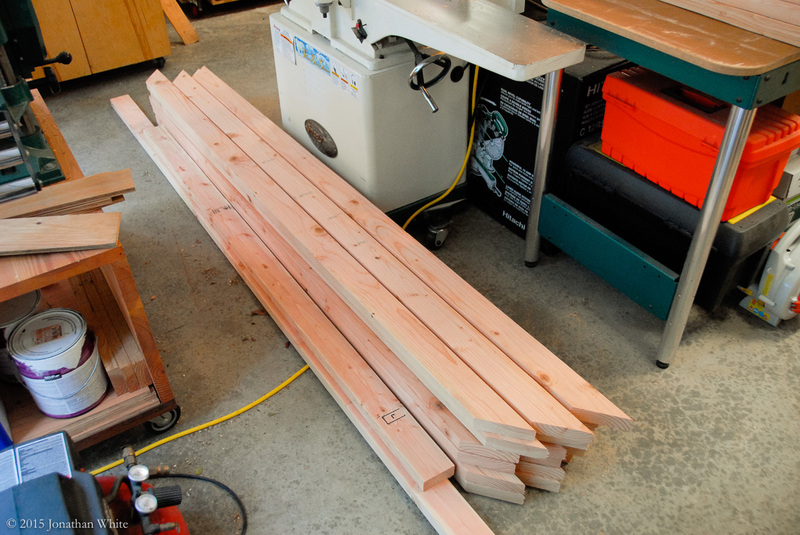 I trimmed them back with a sash saw. 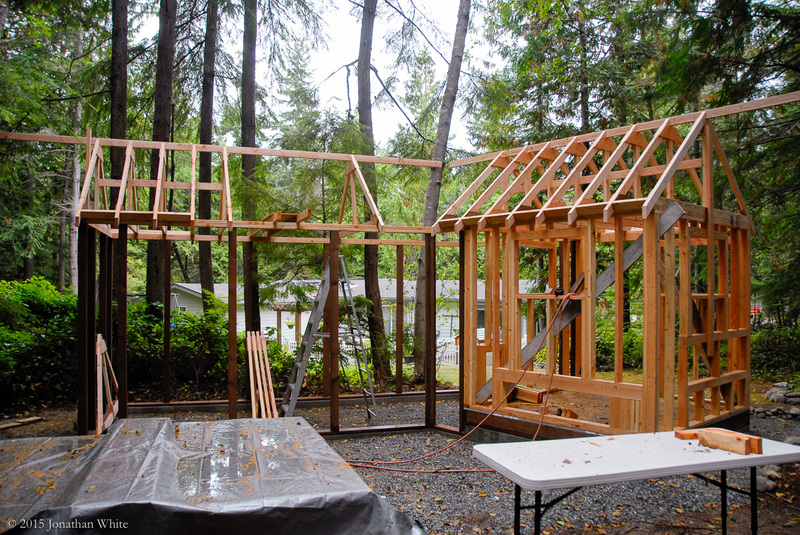 The trusses will have plywood plates on both sides, but the first one will serve as a form to build all the other trusses, so no plates on one side for now. 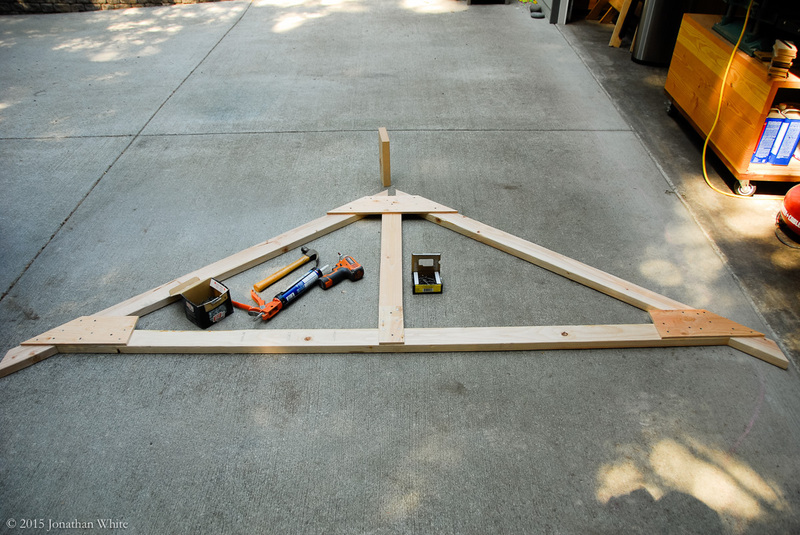 I flipped the truss over and instead of adding the plates on the other side, I added plywood tabs to the edges to make this truss into a form for building the rest of the trusses. The first completed truss with gusset plates on both sides. I made 19 trusses and stacked them around the coop. Truss assembly took me about 3-4 days. Staging the trusses for installation. The first of the trusses going up. Lots of rain kept slowing me down. Standing on top of a wet 2×4, eight feet off the ground is no fun. 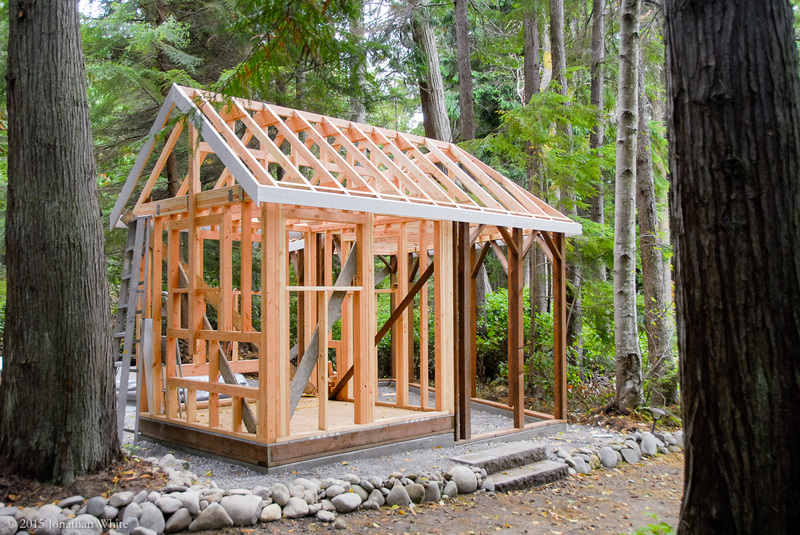 It’s not worth getting hurt just to build this coop, so I had a few days in which I made no progress. Starting at the other end and working towards the middle. 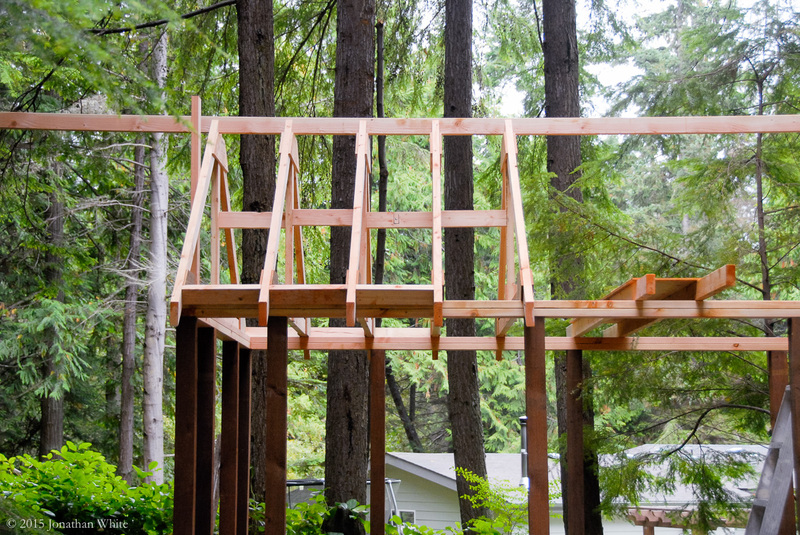 To make things a little safer, I made a platform to stand on while putting up the trusses. 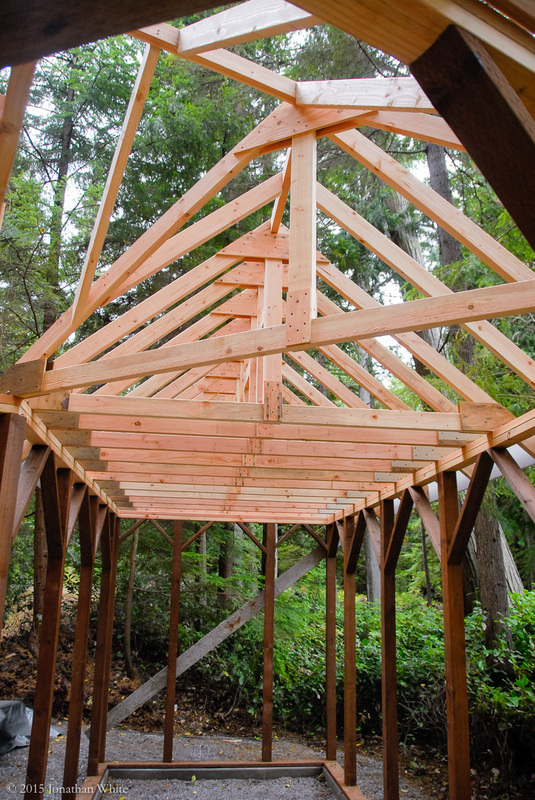 You can see the platform that I made to stand on while I install the trusses. 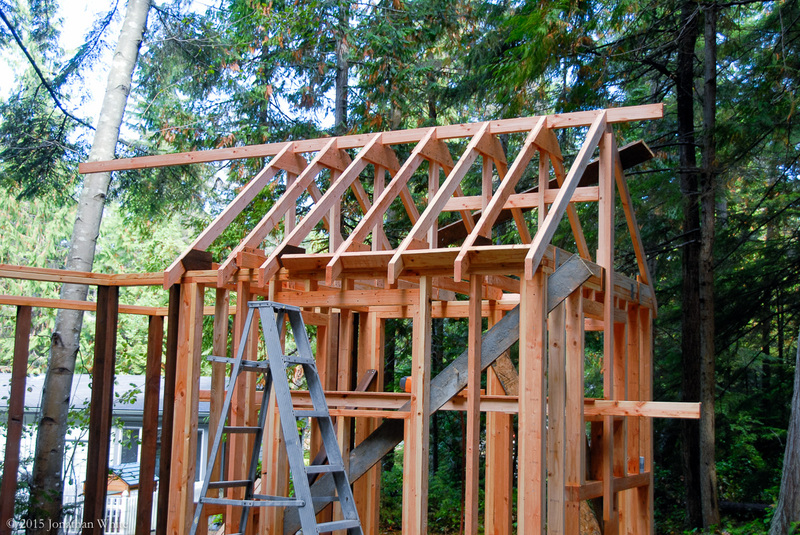 Once I had all the trusses up, I finalized the position of the ridge boards and joined them together. 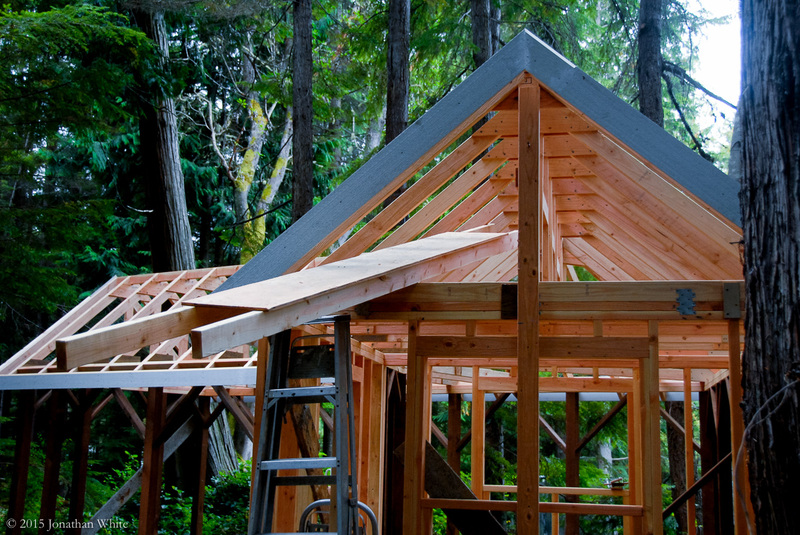 The design of the building means that the corner has to be framed manually since no trusses will fit there. I found a picture online that shows what I mean. It’s not my building, and mine forms a 113° “L” not a 90°, so this is just for clarification. I basically just built a truss in place by first adding a bottom chord, then the hip and valley rafters, then a king stud, and all the plywood gusset plates. This should be very strong. It was also at about this time that I went all around the chicken run and added 2×4 diagonal bracing at the top of all the wall studs. This should stiffen the building up a little and prevent it racking. 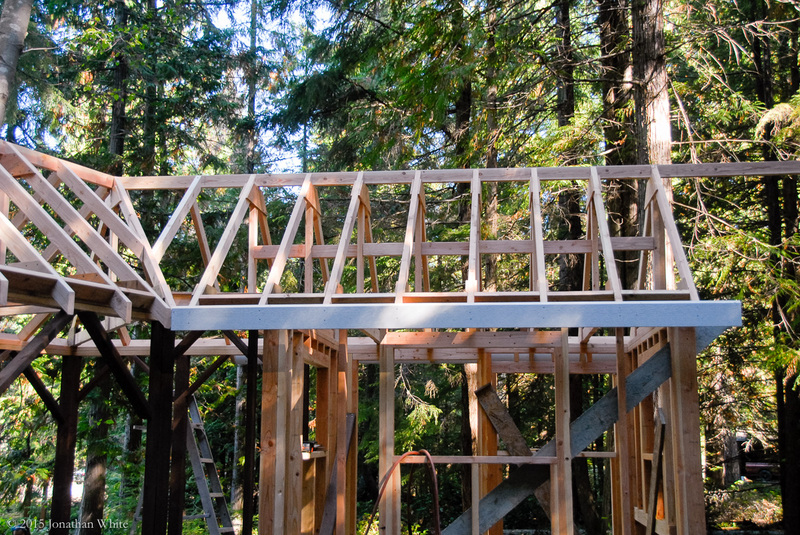 Once all the trusses were installed, I had to manually frame the corner. How I joined the two ridge boards together. A close-up of the intersection. The hip rafter and fill rafters. 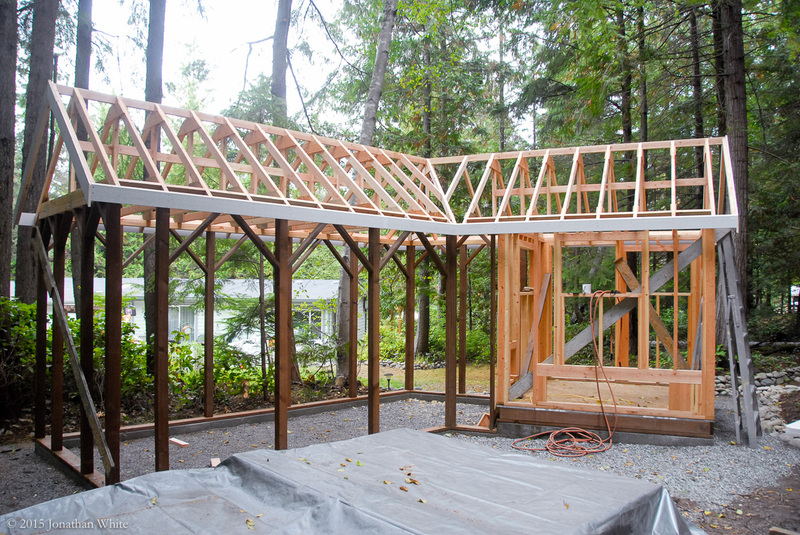 So here, the roof framing is basically done. You can also see the diagonal bracing that was added to the walls. Time to start on the fascia. 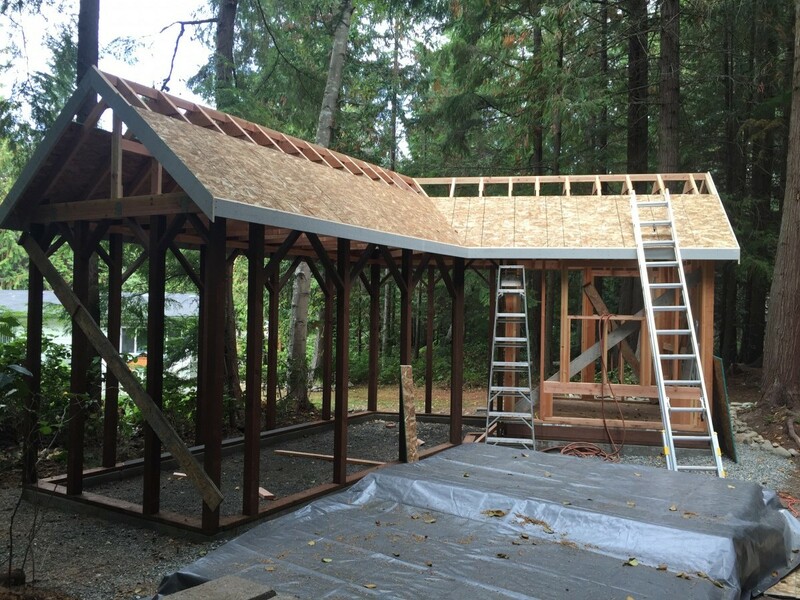 With all the roof framing done, I started on the fascia board. It was tricky getting this stuff up and in place on my own, but eventually I got it. I want to have a small overhang on the ends the roof. A building just doesn’t look right to me without one. To accomplish this, I left the ridge boards and fascia boards long and will fit false rafters to them later. 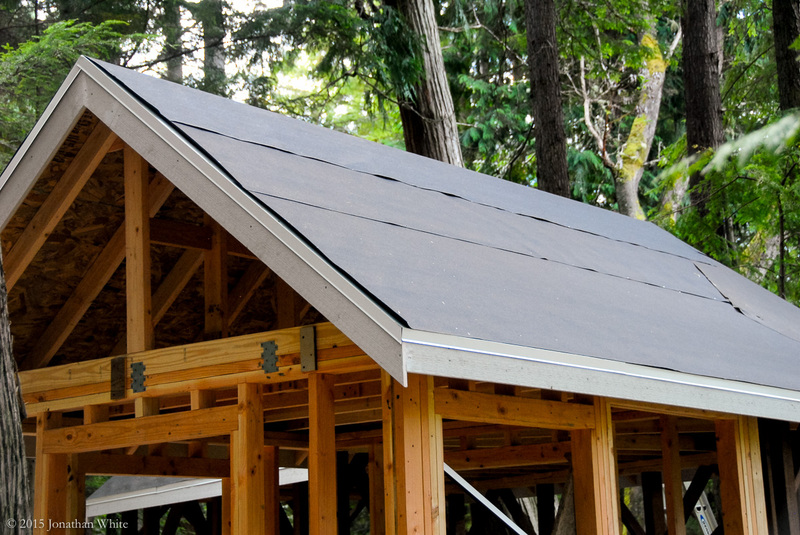 The ridge board and fascia board are deliberately left long. Fascia on the other side. 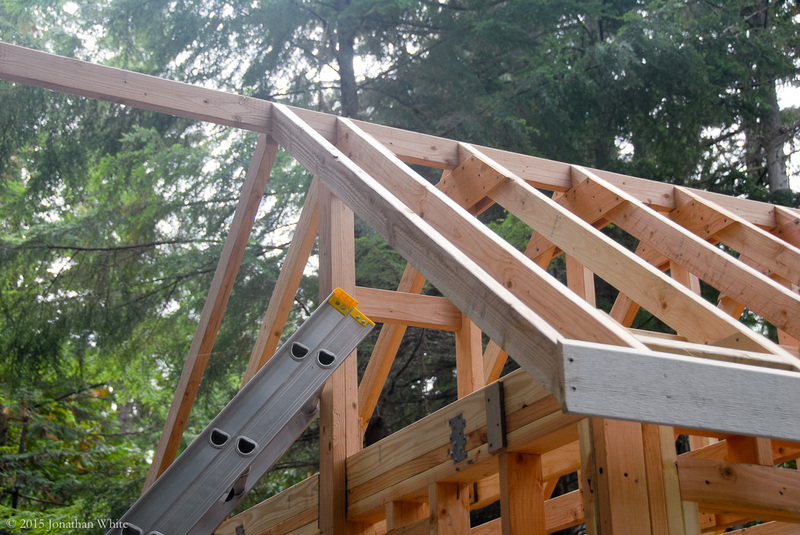 A false rafter is attached to the ridge board and fascia board, creating an overhang. 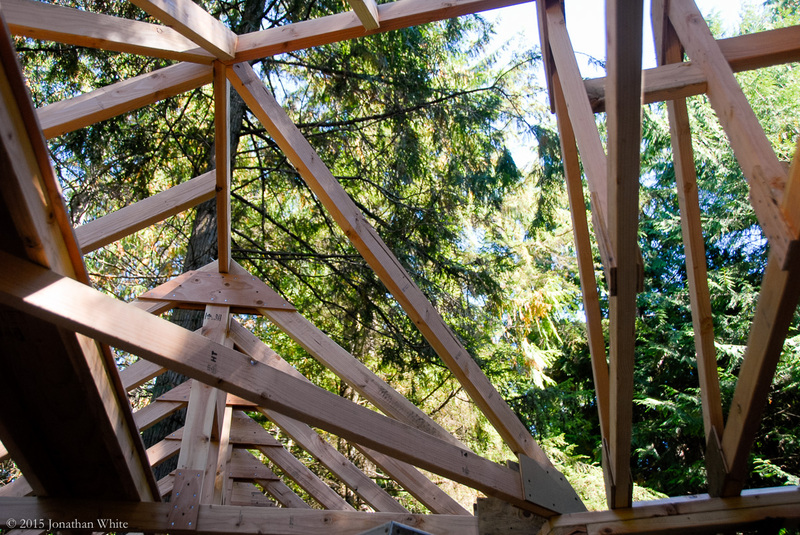 Here you can better see the overhang created by the false rafter. All the fascia board installed. The same overhang is on the other end. A better view of the finished framing from the inside. Before I forgot, I figured I had better remove the platform while I still could. 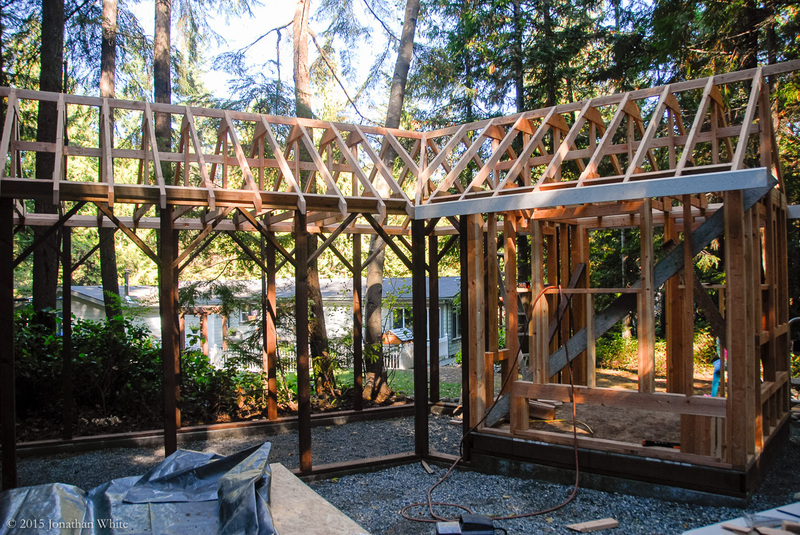 Removing the platform through the opening in the trusses. The first row of OSB sheeting nailed in place. 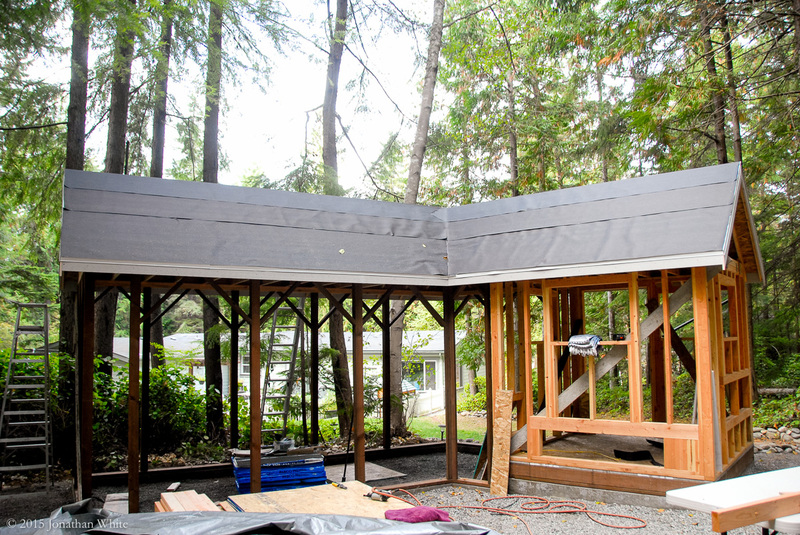 Once the sheeting was all nailed down, I was pretty sick of roofing by this point. I installed a metal drip edge all the way around the roof, but again forgot to take pictures. Once the drip edge was installed, I tacked on a layer of 15lb felt tar paper. I installed OSB sheeting, then drip edge, then 15lb felt paper. I put drip edge on the eves as well. I used a metal valley flashing and felt papered over the top. 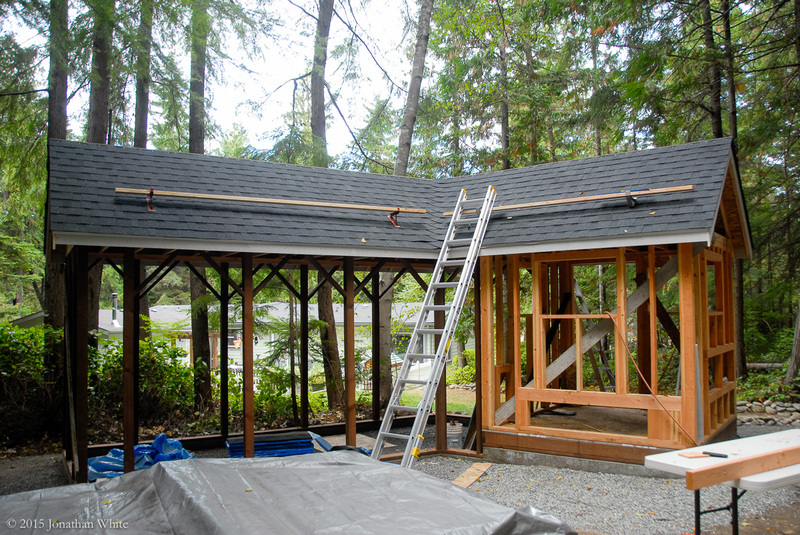 The next step was to install all the roofing shingles. I purchased 4 square of architectural shingles (400 sq ft) and ended up using all but a few shingles. I added some metal brackets to support a scaffold board later. I worked halfway up the first side and added some metal brackets. These are only temporary and will hold a scaffold board so that I can more safely work on the upper parts of the roof later. The first side is done! After completing the fist side, I started working my way up the other side. Getting started on the other side. 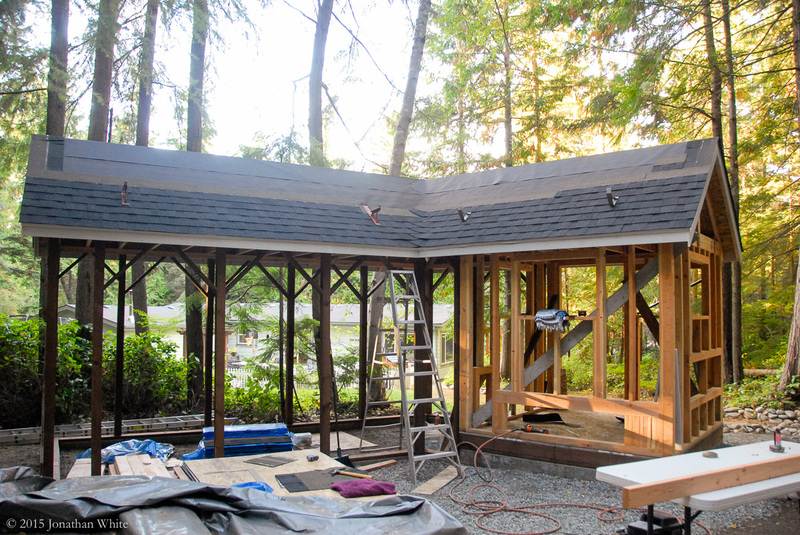 Once I had shingled all the way to the top on both sides, I added a ridge cap (made out of cut up 3-tab shingles) and a hip cap. With both sides finished, I installed a ridge cap and took down the scaffold boards. So here’s the finished roof. Thank god that is over. I also installed a cap at the hip joint. It is done!!! I can’t believe that this took me five weeks. At least now I can work with both feet on the ground and I can now get started putting siding on the hen house. 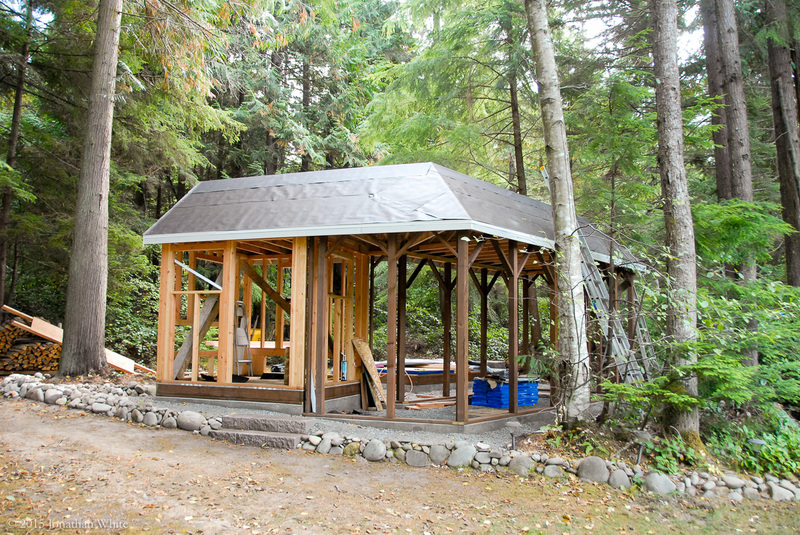 Once the OSB is on the walls, I can install the windows and door. I better get moving. Chicks are going to be delivered on October 21st. Hopefully my next post wont be another month away. This entry was posted in Outdoor Projects and tagged Chicken Coop. Bookmark the permalink. That’s a lot of work for one guy and it looks very well done. I’m sure the chickens will feel like they live uptown in a penthouse. It has been a lot of work. My “summer project” seems to be stretching well into fall. I hope you’re well. Nice job you are making of it. 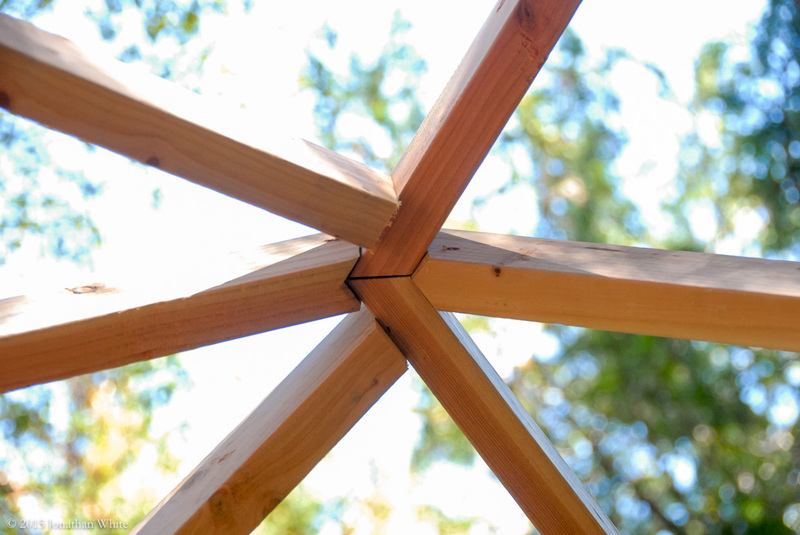 Are you going to install permanent diagonal bracing on the enclosed section? I would strongly recommend it if you are not already doing so. 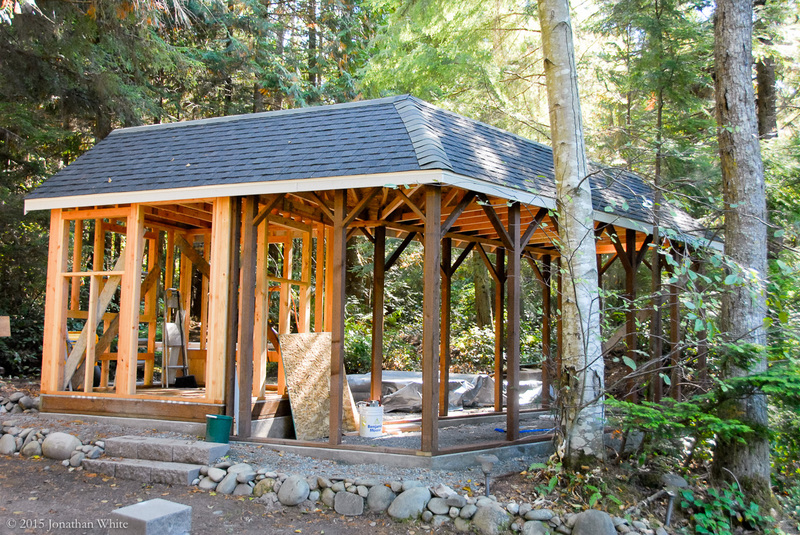 I have seen some pretty substantial outbuildings rack with windload irrespective of the exterior cladding. Or was the intention to sheet/brace the exterior with ply before final cladding?- from where I hail from that is not a common practice as strapping is the common method. 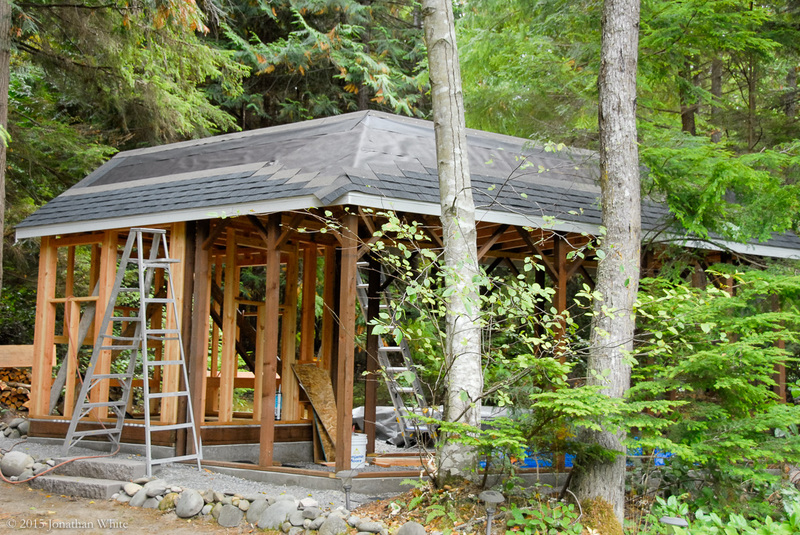 Don’t be to put off by the timeframe, I assembled a pre-made steel garden shed for a customer recently with an fellow handyman and given how flimsy it was, and how time consuming, we concluded something along the lines of what you are doing with studwork would have been a better option. Keep up the good work! Thanks for the comments. They are really appreciated. 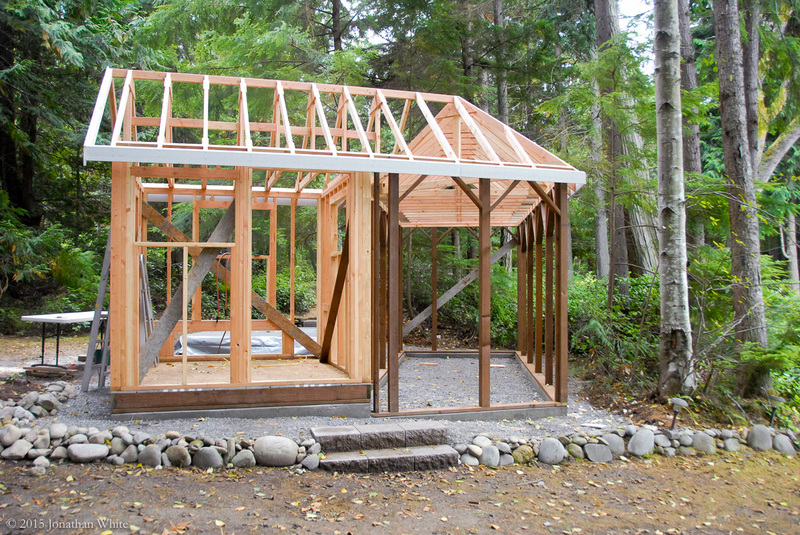 I am going to clad both the outside and inside of the hen house in 4×8 sheets of OSB. Thats the same stuff that I used for the roof. Once nailed in enough places, it should provide plenty of diagonal support. Then outside will then get a layer of tar paper followed by cement plank siding (the same as is on my barn). The exterior run is going to get nothing but hardware cloth (a stronger sort of chicken wire). I really hope that the small diagonal braces that I added at the top of the exterior post walls will be sufficient. It seems a week point to me, but then I do tend to overdo everything. Wow! It looks like something made for a national park. Nice, neat job on the woven valley. Looking good, good progress, look very sturdy. The only thing I question, is why you put the metal flashing under the felt paper? Normally that should go over, to direct the water away from the seams. I first ran a length of tar paper vertically up the valley. The metal flashing went on top of this. The tar paper covering the rest of the roof then went over the flashing. 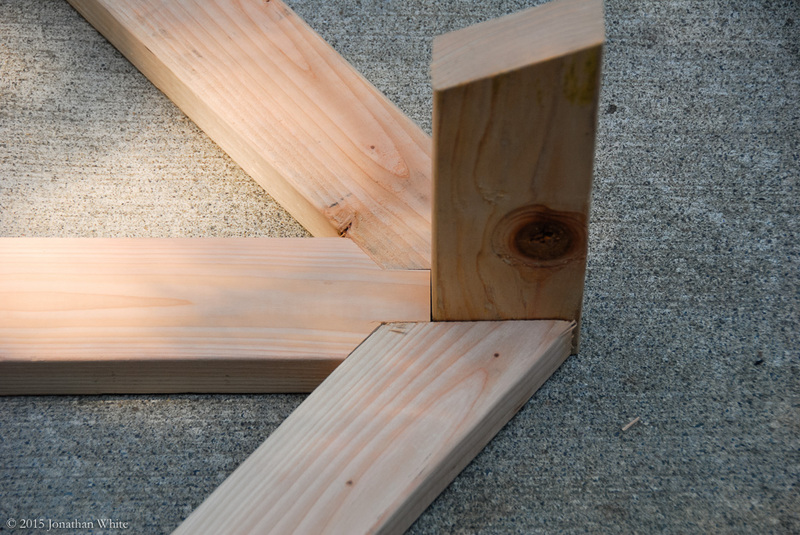 Considering that I ended up weaving the joint in the shingles, the flashing was probably not needed. 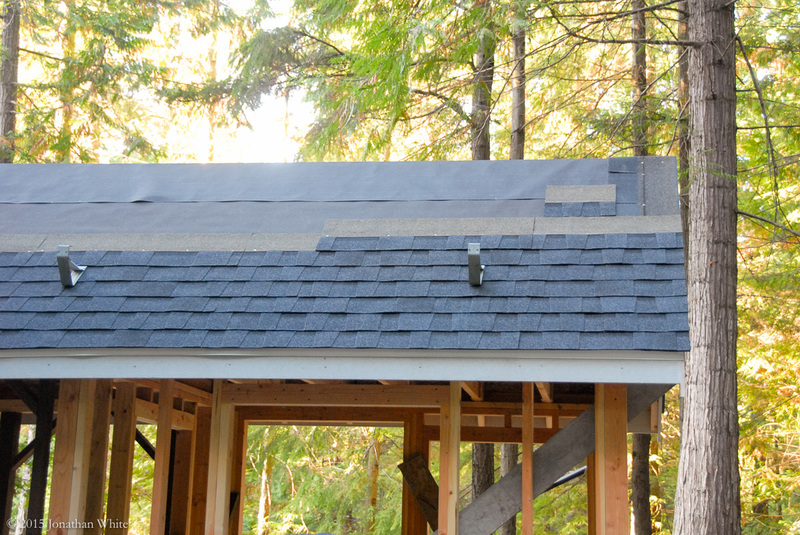 And one last thing, since that roof is under lots of vegetation from the trees, I would have add a strip of zinc metal flashing near the top row of shingle to kill moss grow. The zinc slowly leach out and protect the roof shingles. If you find this to be a problem down the road, just retrofitted it. Not a bad idea! I’ll have to look into that. Wow. This is so impressive. Thank you for sharing. You’re welcome. It is my pleasure. Sorry for my slow response in commenting. The coop is a work of art. I wish I could build something like that. Well done on all the hard work, you are clearly very talented when it comes to building projects like this. Maybe you should come over and build a cabin for us at our camp on the Okavango? Send my regards to the family. Thanks! 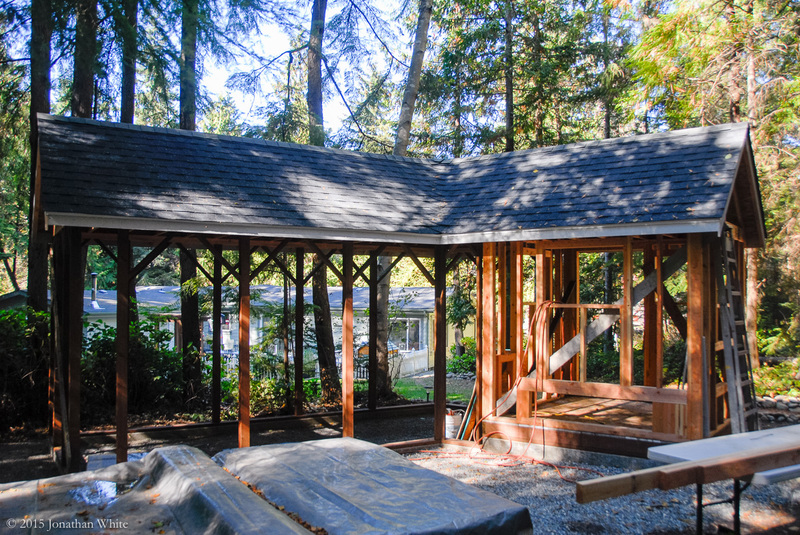 It has been a fun project, but the roofing had me a little fed up. I’m glad that part is done. I got all the windows installed today and wrapped the hen-house in Tyvek. I’ve also got a start on the electrical wiring, but I’ve run out of wire. I think another trip to the hardware store is in order. I enjoy building much more when I can do it with both feet on the ground. I’m sure you’ll have plenty of “shop girls” on hand to assist. Note, that the trial version is currently unlimited. At some point I will probably limit it once it reaches a substantial enough following that warrants charging for it. Thanks for your kind comments. I just took a look at the link you sent and it looks impressive. I have never quite managed to get the hang of SketchUp. I wish that I had, but it seems overly complicated. I suppose I felt the same way when I started using PhotoShop, but I found some great training videos that seemed to simplify it. 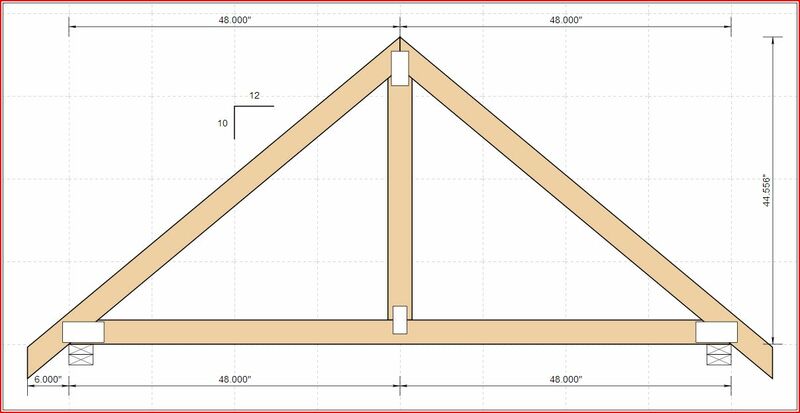 The truss designer is a fantastic tool, even if only used to get a general idea of what you want to build. I found it very helpful. I also took a look at some of your artwork on your website, it’s great! I see that you are also in Washington, I didn’t notice that when was using your site the first time.